I try to keep my rig and antenna on a fairly simple level. So no expensive towers or fancy antennas, just simple wire- or vertical antennas. My home don’t have to look like something any coast radio station would be envious about, so my antennas are simple and almost invisible, good for my neighbors, good for the environment and good for my wallet. The computer is for logging only as well as lookups in QRZ.COM a. o. The computer will never be a part of the radiocommunication whatsoever. On the table you can my Bencher BY-4 and Kent Twin paddles TP1-B. To the right my Vibroplex Original. CW on a PC? Never, I want to have fun. This is my main station. It’s equipted with ATU, Sub-receiver and 100 Watt output. 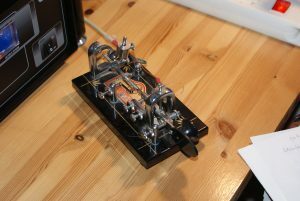 The P3, Panadapter, which gives me an excelent wiew over the band I’m working on. The radio has 11 bands, 6 m through 160 m. The optional 2 m module is not implemented in my radio. PSU: Diamond GSV-3000, 30A at 13.8VDC (Not shown). I have always worked my stations barefooted, but I have to face the fact that bad conditions and competition with 1 kW stations make it difficult with 100 Watts. You might say; why not 1 kW? Simply for security reasons and that with 1 kW I would put the nearest surrounding area TV and radio down. The beast was delivered and used for the first time on February 12, 2019. 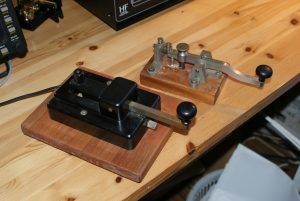 Are used as my spare station and non-home-QTH activities, like fielddays, ILLW etc. Bands: 160-10 m, incl. WARC and 60 m band. Freq. range: 0.5 through 30 MHz. 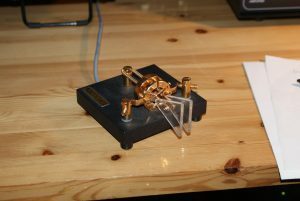 It’s a model CW80 (10-80m bands). 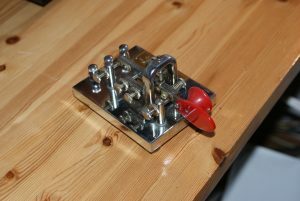 I plan to modify the antenna to the model CW160 (10-160m bands) during the summer of 2019. The antenna also covers the WARC bands. 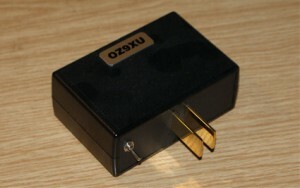 All models need an antenna tuner (ATU). The antenna setup is inverted V, NE/SW. The feed point are up about 12 meters and both ends are up about 4 meters. But as my estate is located on a slope, the end of the long leg is about 5 meters lower than the end of the short leg, relative to the horizontal plane. The vertical element of the antenna is angled about 30 degress away from my alu-pole, according to the manufacturer’s instructions. Perfect for my stiff fingers (hi). My first choice of paddles. Very heavy and solid. Nice to use. Single lever and also nice to use. Magnetic tension, easy to ajust and use. No moving parts or contacts, you just have to touch the paddles. You have to pratice a lot, not easy to use. It CAN be very sensitive to HF on some bands, but else nice to use. Is available in many configurations, with and without internal keyer Electronics. 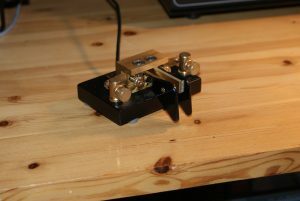 My model have only the paddle Electronics and I use the internal keyer in the K3 transceiver. The black one is similar to the one I – for many years ago – learned the art of CW. My arthritis wrists do not allow them to be used daily, but they are touched once in a while. Ten-Tec PM2B QRP transceiver, 2 Watt, modified to 5 Watt output. Yaesu FT-200 transceiver, 100 Watt output. 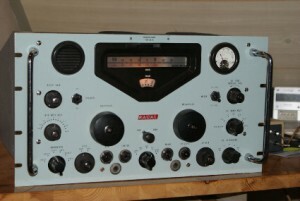 Atlas 210x transceiver, 100 Watt output. Yaesu FT-101ZD transceiver, apx. 120 Watt output. 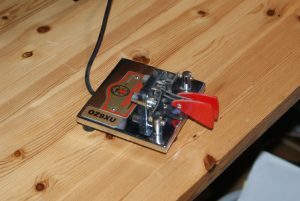 Yaesu FT-840 transceiver, 100 Watt output.